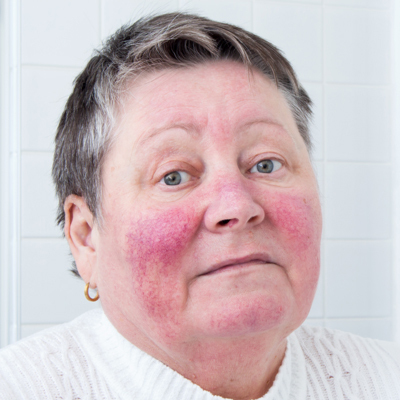 Rosacea is a common skin disease that begins as a tendency to flush or blush easily. As Rosacea progresses, people often develop persistent redness across the nose and cheeks. Eventually this redness may spread to the forehead and chin. Tiny blood vessels, called spider veins, can develop. Eventually small red bumps develop, which may or may not contain pus. The bumps resemble acne, but blackheads do not develop. Rosacea can also cause the affected skin to swell. In more advanced cases, a condition called rhinophyma can develop. Caused by enlarged oil glands in the skin, rhinophyma makes the nose larger and the cheeks puffy. Thick bumps develop. Most people do not develop rhinophyma and those who do tend to be men. Rosacea can also affect the eyes. About 50% of people with rosacea have eye involvement, also called ocular rosacea. This often causes dryness, burning and grittiness of the eyes. Left untreated, ocular rosacea can lead to serious eye complications. People of all races and ethnic groups may be at risk, although fair-skinned adults between the ages of 30 and 50 are at greatest risk. Rosacea can affect men and women at any age, however, and can even affect children. Hormonal shifts can also flare rosacea. Certain things may exacerbate rosacea in some people. Common triggers of rosacea flares are hot drinks, spicy foods, alcohol, caffeine, stress, direct sunlight and extremes of temperature. Your provider can also discuss sensible skin care with an eye toward avoidance of irritating substances in some over-the-counter skin care products. Effective treatment of rosacea involves tailoring a plan to each individual patient. At times, a combination of treatments may be needed, depending on the severity of the case and the presence or absence of eye involvement. Many rosacea treatments are applied directly to the skin in the forms of creams, gels, washes and pads. Faster results may be seen with oral antibiotics. At times, the provider will start the patient on a combination of oral and topical medications with the goal of withdrawing the oral medications as the rosacea improves. Laser procedures can be used to reduce redness and Lasers can also be used to treat the broken blood vessels or spider veins. If you feel you may have rosacea, or have been told that you do, please make an appointment with one of the experienced providers at Brinton Lake Dermatology so that we may tailor a treatment regimen to help you achieve control of this potentially frustrating condition.